Lot Size: 1001.68 sq. m.
This is a nice, cozy home located on a paved road in Pueblo Nuevo, a small rural quiet town just a few minutes from Jaco. This beautiful property is nestled in a nice lot surrounded by hills, located in an exclusive and secure neighborhood, an area many Americans and Europeans have called their home. Only 5 minutes to gas stations and grocery stores. This property is flood proof and designed to drain naturally. Retaining walls are made of cylinder blocks. In front of the house, you will find a cement pad for two cars and a small pool to get refreshed on those hot days equipped with its pumps and filters. A concrete grill is also built in the patio. The lot is landscaped, but has plenty of room to for you to get creative and design your own garden. The home is sold furnished and has three rooms, one full bathroom, equipped kitchen with breakfast bar and wooden cabinetry, dining/living room area. All tile floor, stone details on the front wall. Lockable secure storage in the back of the house. Covered porch and laundry area. The back of the house is adorned with a gracious elevation of the land, a perfect setting to enjoy a Sunday brunch family/friends while taking in the morning sun and scent of nature surrounding the property. This home is ready to welcome you to your stress-free life. When in the mood to enjoy the beach, go shopping , have a nice meal or go partying, just drive10 minutes to Jaco and you’ll get all of that! Or drive about 10 minutes to Los Suenos for a golf game, sport-fishing, and fine dining. Want to buy a home to feel you are on vacation all year round? Come see this lovely house in Pueblo Nuevo. 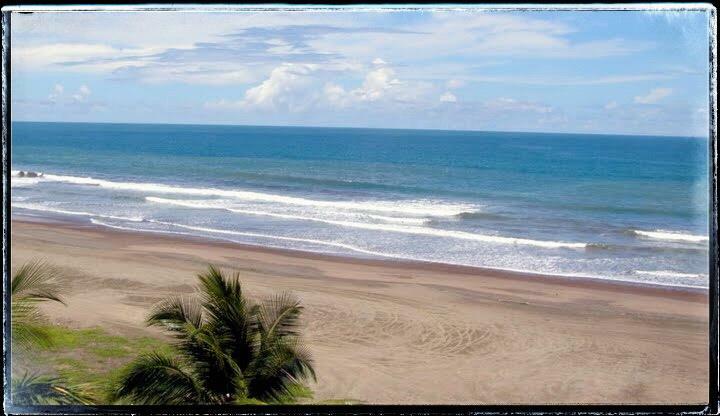 Located in Pueblo Nuevo, only a few minutes to Jaco and Herradura. Only 5 minutes to grocery stores and gas stations.